Arquillian Cube extension to the rescue! AsciidoctorJ in your favorite Java application server? I guess that I don’t need to introduce Asciidoctor (started in 2012) now that it became so popular thanks to the awesome work done by Dan Allen and the community. Well, if you don’t know, Asciidoctor is a fast text processor and publishing toolchain for converting AsciiDoc content to HTML5, PDF, DocBook 5 (or 4.5) and other formats. 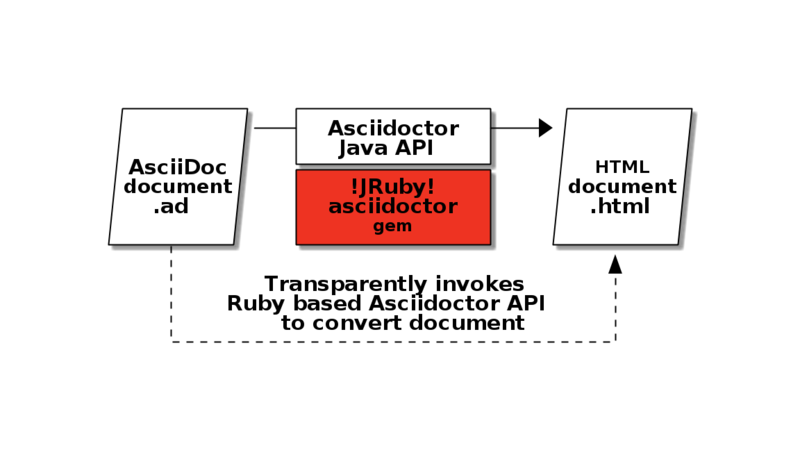 Asciidoctor is written in Ruby, packaged as a RubyGem and published to RubyGems.org. AsciidoctorJ is the official library, started by Alex Soto, for running Asciidoctor on the JVM. Using AsciidoctorJ, you can convert AsciiDoc content or analyze the structure of a parsed AsciiDoc document from Java and other JVM languages. The problem is that if you want to include AsciidoctorJ in your Java application, it doesn’t work easily. Indeed, AsciidoctorJ is based on JRuby and there are some classloader troubles with JRuby as you can read in those different discussions: PR118, Issue 102 and this thread on the asciidoctor discussion list. The solution is to create a new JBoss module with all AsciidoctorJ dependencies and then depend on this module in the target application. So you can follow all those manual steps describe in the documentation to configure your WildFly installation. Arquillian Cube is a very nice project developed by Alex Soto, Aslak Knutsen and the Arquillian community. With Arquillian Cube you can control the lifecycle of Docker images as part of the test lifecycle, either automatically or manually. This gives you the chance to scale up from a integration/functional test level all the way up to the system test level. This project gives you a lot of possibilities, if you want know more about all those features you can read this news on the arquillian website or the documentation on the github project. Ensure that Java, Maven and Docker are installed. If you need help, you can read the Arquillian Cube documentation about boot2docker configuration. Those tests are very simple for now, they will convert the same AsciiDoc file (sample.adoc) to a one PDF file and one HTML file. The project docker-asciidoctorj was created to test different versions of AsciidoctorJ, AsciidoctorJ PDF and others, quickly in the same environment. Some of the most important files of the project are described on the following lines. Until the Docker image is present in your registry, you just have to execute the Maven command. It seems that the JRuby classloader problem is solved by the use of JBoss Modules components. If you try it, I’d love to have your feedbacks, so feel free to add a comment below, on the discussion list or on the GitHub project. The good news here is that the Asciidoctor project now have an easy way to test if the future versions of AsciidoctorJ will be compatible with this architecture. And I’m so proud to have moved my first project to the Asciidoctor github organization and to be one of the Docker Hub administrator for Asciidoctor!